I am so used to starting these NFC blog posts with the first fail of the day so for once I thought I would I would get right to the point. 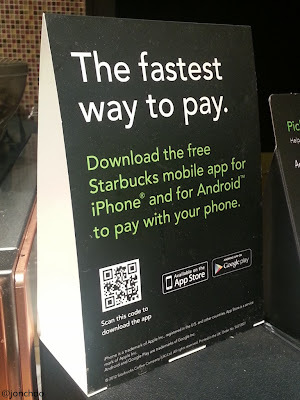 The first NFC fail today comes courtesy of Starbucks, the multi-national behemoth and purveyor of all things wrong with the multi-chain coffee industry. Starbucks has recently been in our headlines for all the wrong reasons, but that's not the purpose of this post. 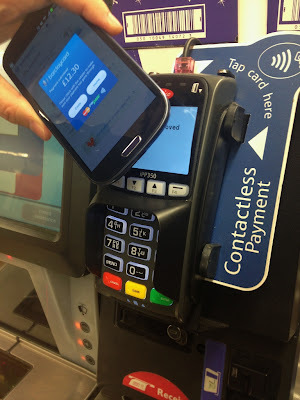 A quick search reveals that they have been deploying two new form of payments - Square in USA and NFC in the UK. Personally I do not understand the significance of deploying Square at their stores as they already have dedicated payment terminals, and magnetic cards are inherently insecure, but that's just me. Then again I am not American, and I am digressing a bit here again. Anyway, after ordering a drink so complex there are actually guides online that teaches you how to do it, I attempted the pay. The store I visited does not in fact accept contactless payment, but you probably knew that already. That's £2 something I am never going to see again, but hei, it's all in the name of research! So not only are Starbucks paying zero corporation tax for the watery none-coffee coffee they sell, they are also way behind the curve when it comes to adapting new payment technology. In addition to, you know, making proper coffee. Sure, they accept payment via the smartphone's display (which is rather neat I admit), but this by itself isn't safe (anyone can clone your barcode easily) and requires the customer to have a dedicated Starbucks account. Tut tut. Back to the drawing board Starbucks. Also, please learn how to pull a decent shot of espresso. My second fail of the day was a pretty major one. This occurred at the Marks & Spencer branch at St Albans. Here I was aiming to complete the 'buy flowers for your partner' challenge. I am rubbish at this task, just ask my girlfriend. So after spending a good 10 minutes looking at them, I picked up a bouquet of roses (I know, how cliche), then went on to pay. This was when the biggest contactless fail of the week happened. 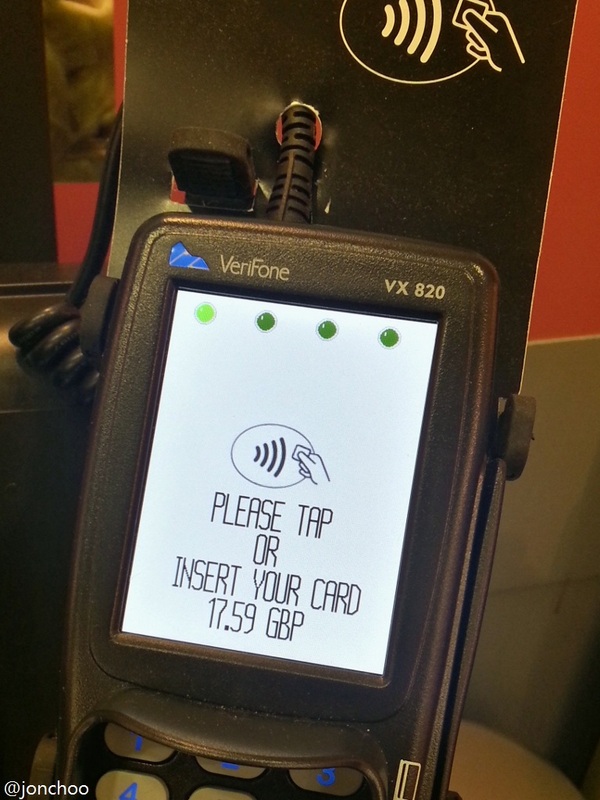 M&S has self service terminals fitted with contactless. I have used them before in London, without much problems (I will get back to this). Attempting to pay, an error message flashed on the terminal warning that I had two contactless chips. Now this happened in London yesterday at another M&S store, but the payment went through after I tried it again. Instead, the machine here kept on beeping the same error message. In fact it appears that my phone recognises the terminal to the point of flashing the typical 'transaction successful' message in the Barclaycards app, before crashing totally. Aware that I may have encountered a malfunctioning machine, I moved to the next self service checkout and started over again. The same thing happened again. I asked the staff for help and he merely shrugged claiming that these machines were old (contactless is old? Really?) and unreliable and he has never seen anyone successfully paying with their phones. Red faced by the whole situation, I retreated, embarrassed. Moving on, I half expected to end the day contactless-less, but I suddenly remembered that the local Tesco actually sells flowers. Hurrah! 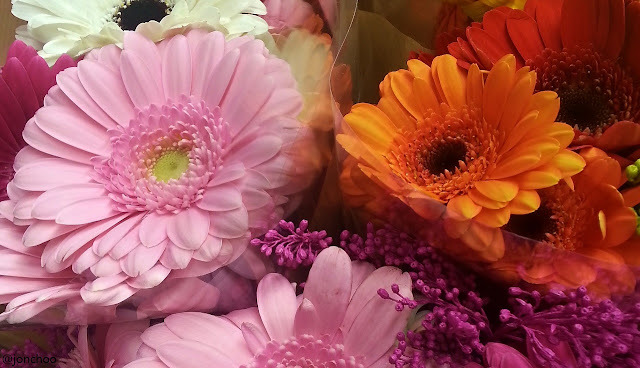 I half expected the flowers to be rubbish, you know, Tesco stuff, but there were a few gems in there. To be honest I know nothing about flowers other than I am allergic to some flowers of which I can't remember which! But the misses was happy, so I am happy! While en route to Tesco, I stopped at Nando's for dinner. Sadly it appears that news of Nando's embracing contactless payment was widely off the mark, so minus one point to Nando's for not keeping their promises and minus another point for burning my chicken! Curiously, the exact same error that plagued my attempt at M&S happened again at Tesco! Remembering something I read yesterday regarding the phone running on a proprietary Orange SIM card, it dawned on me why readers were complaining about multiple NFC devices being present. The Samsung Galaxy S III I have been using has its own NFC chipset, but so does the Orange SIM card. The machine that M&S and Tesco installed were obviously confused by the two. Aligning the phone in such a way that only the SIM card was in 'contact' with the reader solved the problem. This is a problem that should not have happened but is because the industry can't sit down and agree on a single standard. For example, why doesn't the app uses the baked-in on-device NFC chipset for mobile payment? Overall, while it was a rather rubbish contactless day, I am happy with at least completing the flower challenge. With Ewan catching up rapidly and right on the tail, the flower challenge allowed me to extend my lead ever so slightly. Still, the race is getting tighter and there are a few more tough challenges to go. If you want to issue challenges to either of us, do so on twitter using the #GemaltoNFC hashtag.